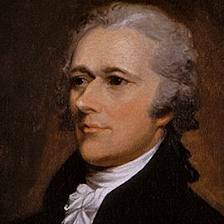 Industry and Commerce, Manufactures, Iron: Hamilton to the House of Representatives, December 5, 1791. Part Two. The manufactures of this article are entitled to pre-eminent rank. None are more essential in their kinds, nor so extensive in their uses. They constitute, in whole, or in part, the implements or the materials, or both, of almost every useful occupation. Their instrumentality is everywhere conspicuous. It is fortunate for the United States that they have peculiar advantages for deriving the full benefit of this most valuable material, and they have every motive to improve it with systematic care. It is to be found in various parts of the United States, in great abundance, and of almost every quality; and fuel, the chief instrument in manufacturing it, is both cheap and plenty. This particularly applies to charcoal; but there are productive coal mines already in operation, and strong indications that the material is to be found in abundance in a variety of other places. The inquiries to which the subject of this report has led have been answered with proofs that manufactories of iron, though generally understood to be extensive, are far more so than is commonly supposed. The kinds in which the greatest progress has been made have been mentioned in another place, and need not be repeated; but there is little doubt that every other kind, with due cultivation, will rapidly succeed. It is worthy of remark, that several of the particular trades of which it is the basis are capable of being carried on without the aid of large capitals. Iron-works have greatly increased in the United States, and are prosecuted with much more advantage than formerly. The average price, before the Revolution, was about sixty-four dollars per ton; at present it is about eighty—a rise which is chiefly to be attributed to the increase of manufactures of the material. The still further extension and multiplication of such manufactures will have the double effect of promoting the extraction of the metal itself, and of converting it to a greater number of profitable purposes. Those manufactures, too, unite, in a greater degree than almost any others, the several requisites which have been mentioned as proper to be consulted in the selection of objects. The only further encouragement of manufactories of this article, the propriety of which may be considered as unquestionable, seems to be an increase of the duties on foreign rival commodities. Steel is a branch which has already made a considerable progress, and it is ascertained that some new enterprises, on a more extensive scale, have been lately set on foot. The facility of carrying it to an extent which will supply all internal demands, and furnish a considerable surplus for exportation, cannot be doubted. The duty upon the importation of this article, which is, at present, seventy-five cents per cwt., may, it is conceived, be safely and advantageously extended to one hundred cents. It is desirable, by decisive arrangements, to second the efforts which are making in so very valuable a branch. The United States already, in a great measure, supply themselves with nails and spikes. They are able, and ought certainly, to do it entirely. The first and most laborious operation, in this manufacture, is performed by water-mills; and of the persons afterwards employed, a great proportion are boys, whose early habits of industry are of importance to the community, to the present support of their families, and to their own future comfort. It is not less curious than true, that, in certain parts of the country, the making of nails is an occasional family manufacture. The expediency of an additional duty on these articles is indicated by an important fact. About 1,800,000 pounds of them were imported into the United States in the course of a year, ending the 30th of September, 1790. A duty of two cents per pound would, it is presumable, speedily put an end to so considerable an importation. And it is, in every view, proper that an end should be put to it. The manufacture of these articles, like that of some others, suffers from the carelessness and dishonesty of a part of those who carry it on. An inspection in certain cases might tend to correct the evil. It will deserve consideration whether a regulation of this sort cannot be applied, without inconvenience, to the exportation of the articles, either to foreign countries, or from one State to another. The implements of husbandry are made in several States in great abundance. In many places it is done by the common blacksmiths. And there is no doubt that an ample supply for the whole country can, with great ease, be procured among ourselves. Various kinds of edged tools for the use of mechanics are also made; and a considerable quantity of hollow wares, though the business of castings has not yet attained the perfection which might be wished. It is, however, improving, and as there are respectable capitals, in good hands, embarked in the prosecution of those branches of iron manufacture which are yet in their infancy, they may all be contemplated as objects not difficult to be acquired. To insure the end it seems equally safe and prudent to extend the duty, ad valorem, upon all manufactures of iron, or of which iron is the article of chief value, to ten per cent. Fire-arms and other military weapons may, it is conceived, be placed, without inconvenience, in the class of articles rated at fifteen per cent. There are already manufactories of these articles, which only require the stimulus of a certain demand to render them adequate to the supply of the United States. It would also be a material aid to manufactures of this nature, as well as a means of public security, if provision should be made for an annual purchase of military weapons, of home manufacture, to a certain determinate extent, in order to the formation of arsenals; and to replace, from time to time, such as should be drawn for use, so as always to have in store the quantity of each kind which should be deemed a competent supply. But it may, hereafter, deserve legislative consideration, whether manufactories of all the necessary weapons of war ought not to be established on account of the government itself. Such establishments are agreeable to the usual practice of nations, and that practice seems founded on sufficient reason. There appears to be an improvidence in leaving these essential implements of national defence to the casual speculations of individual adventure—a resource which can less be relied upon, in this case, than in most others; the articles in question not being objects of ordinary and indispensable private consumption or use. As a general rule, manufactories on the immediate account of government are to be avoided; but this seems to be one of the few exceptions which that rule admits, depending on very special reasons. Manufactures of steel, generally, or of which steel is the article of chief value, may, with advantage, be placed in the class of goods rated at seven and a half per cent. As manufactures of this kind have not yet made any considerable progress, it is a reason for not rating them as high as those of iron; but, as this material is the basis of them, and as their extension is not less practicable than important, it is desirable to promote it by a somewhat higher duty than the present. A question arises how far it might be expedient to permit the importation of iron, in pigs and bars, free from duty. It would certainly be favorable to manufactures of the article; but the doubt is, whether it might not interfere with its production. Two circumstances, however, abate, if they do not remove, apprehension on this score: one is the considerable increase of price which has been already remarked, and which renders it probable that the free admission of foreign iron would not be inconsistent with an adequate profit to the proprietors of iron-works; the other is the augmentation of demand which would be likely to attend the increase of manufactures of the article, in consequence of the additional encouragements proposed to be given. But caution, nevertheless, in a matter of this kind is most advisable. The measure suggested ought, perhaps, rather to be contemplated subject to the lights of further experience, than immediately adopted.